Alex Bontje retaliates after taking a hit from Jordan Himley during the third. 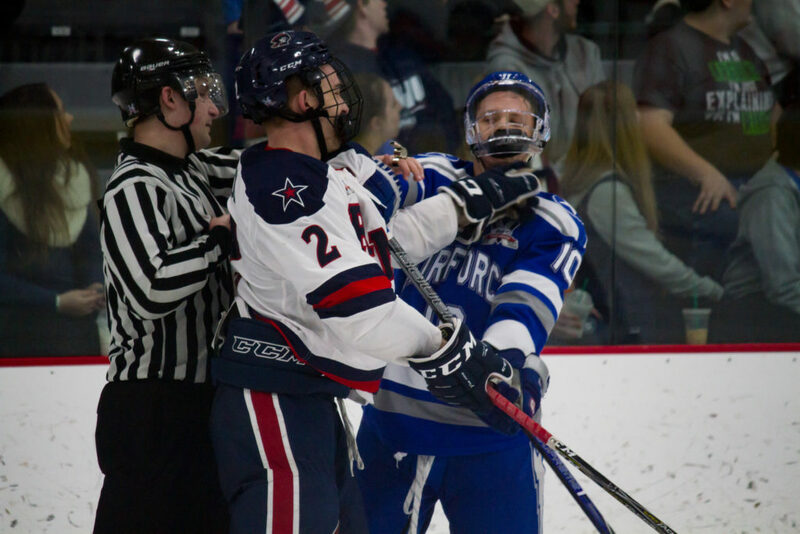 NEVILLE TWP., Pa. — The Air Force Academy squared up against Robert Morris University in the final regular season series at the RMU Island Sports Center. The Air Force Falcons shutout the Colonials 1-0 in the typical physically demanding Friday night match up. Erik Baskin took an early lead for the Falcons just 4 minutes into the game. Despite Robert Morris outshooting the Falcons 29-23, the Colonials were unable to tie the game. Zack Mirageas took a five-minute major in the first period for a Contact to the Head penalty against Luke Lynch and a game misconduct. Timmy Moore took a five-minute penalty for Spearing and a game misconduct in the second. Tomorrow, the Colonials will celebrate their nine-person senior class: Alex Bontje, Brett Beauvais, Elias Ghantous, Brady Ferguson, Spencer Dorowicz, Timmy Moore, Robert Powers, Andrew Pikul, and Alex Dagnal. There will be a short ceremony before the 7:05 p.m. puck drop. Michael Coyne talks to, former Juniors teammate, Dan Bailey during warm ups. Alex Bontje warms up in preparation for his return to the lineup. Tyler Ledford balances a puck on his stick during warm ups. Tyler Ledford warms up with the Falcons as kids cheer. Three fans show up with unicorn masks. Erik Baskin and team celebrate after Baskin scores 4 minutes in. Alex Robert handles the puck during the first period. Alex Bontje smiles during the first period after dishing a hit that sent him to the box. Matt Graham shoots the puck during the second. Brandon Watt blocks a pass in front of the benches. Brady Tomlak yells to a teammate during the second period. Kyle Haak follows the puck after a deflected shot from Spencer Dorowicz. Matt Serratore leaves the ice after getting tripped during the third. Eric Israel puts a hand up in the air after exchanging blows with Erich Jaeger.